Hey folks! I'm lucky enough to be part of the month-long Lux Prompt Tour (also known as the month of Daemon), and we have a lot of things in store for you! First and foremost, Lux: Beginnings (Obsidian & Onyx) and Lux: Consequences (Opal & Origin) were released on June 3, 2014, and they are now available everywhere books are sold, including your local Target, B&N, and Walmart. 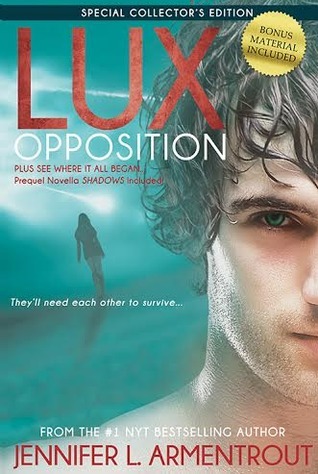 Next up, Opposition will be available next month, and we have the cover and blurb for you! Also included in Opposition is Shadows, the prequel novella! What do you like most about the Lux series? Me, I like the back story the most. I love how Jennifer explored the Luxen race, as well as the past of Daemon and his siblings. Stories about aliens have always been my weakness, and believe me when I say that the Lux series doesn't disappoint! I love when Daemon calls Katy kitten and I love that story is about an alien Luxen race. <3 Great post. Katy and Daemon moments! It's so sweet and made me love them more. how Daemon will do anything for his family and katy! I like that the books are about hot aliens. I love aliens. I love how Jennifer L. Armentrout writes. I love everything about that books. The love between Katy and Daemon is so sweet and adorable.